The Ancient Sumerians worshipped many different gods and goddesses. They thought that the gods influenced much of what happened to them in their lives. Babylonian and Assyrian religion was heavily influenced by the Sumerians. Each city had its own god. At the center of the city was a large temple or ziggurat built to that god. This was where the priests would live and make sacrifices. Some of the ziggurats were huge and reached great heights. They looked like step pyramids with a flat top. Anu - Sometimes called An, Anu was the god of the heavens and king of the gods. The city associated with Anu was Uruk. Enlil - The god of air, wind, and storms, Enlil held the Tablets of Destiny. These tablets gave him control over the fate of man and made him very powerful. He wore a crown with horns. He was associated with the city of Nippur. Enki - Enki was the shaper of the world as well as god of wisdom, intellect, and magic. He invented the plough and was responsible for making plants grow. He is drawn holding Zu, the storm bird. He was god of the city of Eridu. Utu - The god of the sun as well as justice and the law, Utu is drawn holding a saw like instrument. Mythology says that Utu travels across the world each day in a chariot. Inanna - Inanna was the goddess of love and war. Her symbol is a star with eight points. Her primary city was Uruk, but she was also prominent in the city of Babylon. Nanna - Nanna was also called Sin. He was god of the moon. His home was the city of Ur. 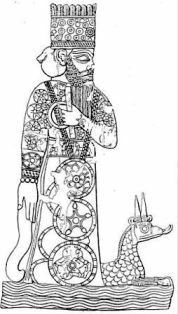 Marduk - Marduk was the primary god of the Babylonians and had Babylon as his main city. He was considered the supreme deity over all the other gods. He had as many as 50 different titles. He was sometimes pictured with his pet dragon. Nergal - God of the underworld, Nergal was an evil god who brought war and famine on the people. His city was Kuthu. Tiamat - Goddess of the sea, Tiamat is drawn as a huge dragon. Marduk defeated her in battle. Ashur (Assur) - The primary god of the Assyrians. He was also the god of war and married to the goddess Ishtar. His symbols are a winged disc and the bow and arrow. Ishtar - Similar to Inanna, she was goddess of love and war. Elil - The Assyrian version of Enlil. The main religion of the Persians was called Zoroastrianism. It was based on the teachings of the prophet Zoroaster. In this religion there was only one god named Ahura Mazda. Ahura Mazda created the world. He was all good and constantly fought against evil. The Persians believed that good thoughts and actions would help to fight the evil. The Sumerian gods often had human characteristics in that they were sometimes good and sometimes bad. Although Anu was an important Mesopotamian god, archeologists have yet to find a picture of him. They also believed in genies, demons, and evil spirits. The god Shamash was served by scorpion people, a combination of man and scorpion. They believed that the Earth floated on an ocean of fresh water. Enlil was said to be so powerful that the other gods could not even look at him. Greek mythology likely borrowed many ideas from the Mesopotamian gods.